The day I've been waiting for finally came and went with much pain and lessons learned. Let's take a closer look at the race and how I faired. Check out my strategies and goals going into the race here. The start: The race started out at Koomer Ridge Campground. I started at a quick pace running behind a few groups of people. I knew one of my faults from all of my longer races thus far was going out too fast. 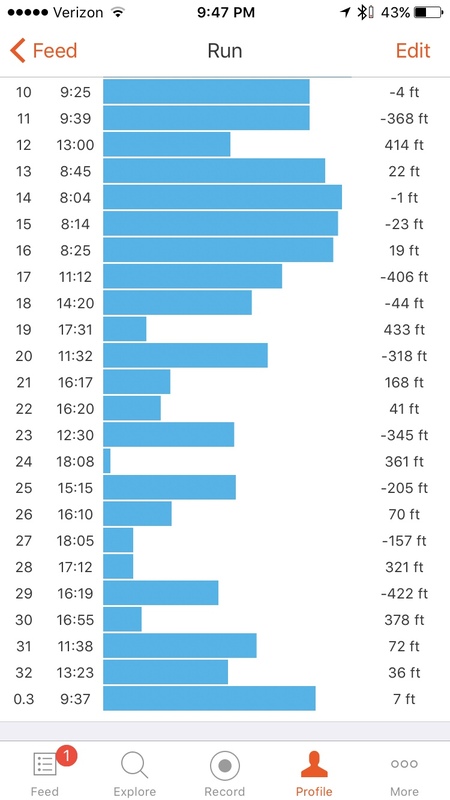 This race I knew I wanted to keep a quick tempo for the first half of the race, so the only thing I was worried about was how the first hill would feel on my legs. We were down the ravine and climbing before I knew it. I felt solid going up the first climb. It was a big mile long ~450ft climb up to the Sheltowee Trail which then led to the Grey's Arch parking lot. I took a few miscalculated steps and fell into the sand on the long stretch of trail out to the road. This part of the trail seemed to pass by really fast. When I hit the road I kept telling myself I needed to settle in and maintain a quick but easy pace. It was around here the one hour mark had passed. I had covered the first six miles in around an hour to average an approximately 10 minute mile pace. The road section went on for what seemed like forever. I had run all of the trails in the race before hand. I, however, opted not to practice the road section because it seemed really easy. Well, I was wrong. It was boring and seemed to sap some of my energy. Luckily, Auxier Ridge finally came into view and down the trail we went. I had taken a Gu around 25 minutes but it seemed to mess with my stomach. I was feeling hungry and nauseous. I'm not sure if it was a combination of not eating enough pre-race or not consuming Gu's in a few months/weeks that it made my stomach nauseous. Luckily, I made a last minute dash late the night before the race to the grocery store for some double stuffed Oreos. 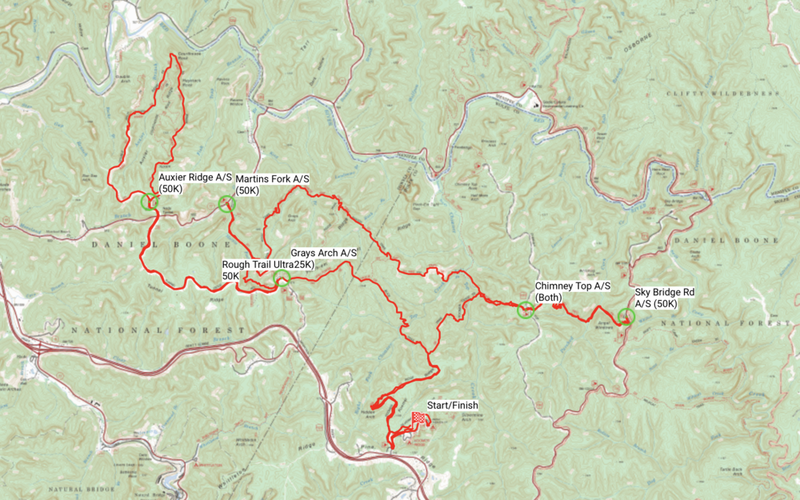 I was able to eat a few Oreos before hitting the Auxier Ridge Trail to maintain some calories. I knew my body would be craving energy if I had to hit the next major climb without anything in my stomach. "Luckily, I made a last minute dash late the night before the race to the grocery store for some double stuffed Oreos." Along Auxier Ridge I was struck by the beauty, even though I had seen the ridge many times before. I think something about the morning light or the fact I still had a long day ahead of me made me want to stop and take pictures. I, didn't, but I definitely hope someone did that morning because it was spectacular. The descent and following climb were technical and rough. It was here I started to feel some fatigue in my muscles. I started to feel cramping in my quads as I was ascending the stairs to get out of the narrow canyon. After reaching the forest road, I made sure I had quick turnover in my legs to flush some of the building acid out and keep the pace moving as it would have been too easy to carry out a slow pace over such easy terrain. The run from the Auxier Ridge Trailhead back to Grey's Arch parking lot went more smoothly on the way back. Again, I kept the pace high. I was feeling good with a little bit of fatigue as I turned the corner off of the road to take the trail down to Martin's Fork. As soon as I turned the corner, I felt a complete 180 degree turn in how I felt. My legs were sluggish. My stomach was now screaming for food and I was trying not to throw up. Descending the several hundred feet to the turnaround point proved arduous in my current condition. This was point was only halfway, 16 miles in. Meaning I still had approximately another 16 to go and definitely the harder half of the race left in front of me. At this point in the race I had reached halfway at about 2 hours and 45 minutes. My goal of breaking 7 hours was still intact. Actually, I was doing REALLY well based on time. In my head I decided I just needed to average 15 minute miles for the next 16 miles and I would beat my goal of 7 hours. Re-evaluating at this point and making a strategy of how to attack the second half of the race really helped me mentally. Arriving at Martin's Fork, where there was an aid station, I completely gorged myself. I consumed 5-6 dill pickles, a few orange slices, sword energy drink, water, and some skittles. Trotting out of the aid station I knew it was time for battle and time to face the infamous Rough Trail. Somewhere down in the valley is a trail called the Rough Trail that shows no mercy. Halfway: I started by walking a good half mile. Turning up the trail going up to Grey's Arch Trail, I had felt better and got my legs under me. The pickles really calmed my stomach and helped my ever cramping legs. Crossing the large swaths of rock with seemingly no easy way up I knew it was best to take it slow and consistent. When I finally crawled up to the top, there was a good amount (1/4 to 1/2 of a mile?) of flat to semi-downhill terrain before heading down the steep descent to Grey's Arch. Quick work was made of this section, and I was able to get some of my legs under me, recovering some energy. However, as fast as we went down we were about to go right back up. The next two climbs would run together in my head. I knew I just had to persevere through them. There was one point I tripped and fell into the middle of the trail. Simultaneously, my left calf cramped up into the tightest ball I could have imagined and it took a second of rolling around on the trail before I could get myself back up and keep running. Another downhill lead us to the split of the out and back. This out and back went up to Chimney Top road and then continued to Sky Bridge road. The run up to Chimney top road was steep and climbed slow. There were few points where I ran. I started to really feel the cramping in my legs again. On reprieve before you get to the road, there is a mellow downhill into the aid station. This was a great place to stretch out the legs and try go get them to recover as much as possible. At the aid station I again chowed down on a pile of pickles, oranges, and Rice Krispie treats. I had arrived to the aid station by 4:30. My goal based on training was to be back to the aid station in one hour. Leaving the aid station is a mellow downhill to about a good quarter mile of flat trail. I ran through this section and all the way down to the creek. I was feeling good... until the next climb. I walked the majority of the climb to the parking lot. I scarfed down the remainder of my Oreos and started the slow trot back to Chimney top road. Slow it was, I was pooped. Eventually I had made it back to the Chimney top aid station in my desired time of 5:30. I asked how many miles it was to the finish line and they told me it was 4 miles. "It was time to turn on the afterburners"
It was time to turn on the afterburners. Four miles in one hour would mean I would finish at 6:30. I made my goal to finish under 6:30 and push the pace as much as I could. Little did I remember, I still had the massive climb to get up to Koomer Ridge. This climb took a lot out of me. I actually stopped and asked hikers if this was the right trail to get back to Koomer Ridge. They replied yes and on I went. As soon as you crest the ridge on the Koomer Ridge Trail, the trail actually flattens out for quite a bit. It is here you merge back onto the trail we ran on the way out and have to run back down to hidden arch. I was looking at my watch and knew I would be close to the time. There was a couple that said they were half a mile from the finish... I had 5 minutes. I needed to run a 10 minute mile... Easy right? Well it didn't feel easy. I pushed for that last five minutes, including the final little spurt up to the final chute. I had thought about, well, I had already beaten my goal by a lot, why should I push? But I'm glad I didn't give up. I still had some fight left in me. My final time was 6:28:47. My Splits from Strava are below. Post Race: I realize now sub 6 on the Rough Trail is definitely doable. I need to train more next time if that's a goal I want to achieve. I still need to work on my cramping issues with my muscles. The Pickles definitely helped. I'm not sure if I should eat more earlier or how to attack that issue. If you have any solutions that have helped for you let me know! I'm not nearly as sore as the last ultra I ran. I attribute this to continuing to move after my race as well as stretching. I also made sure I went for walks, and moved around after I arrived home later that afternoon. What's Next? : I've signed up for the Bluegrass Half marathon at the end of March. My goal for that is to run Boston Qualifying pace for the whole half marathon (under 7 minute miles). I feel this will be a good goal to challenge me to go faster and give me a different type of goal to shoot for. I'm also going to jump back into climbing and get out to find some ice and cracks this winter. Can't wait to see what adventures come up!